Thank god for crappy hospital food. Seriously, as much as I respect and liked my caretakers at Lucile Packard Children's Hospital at Stanford, their food was not all they advertised. Big surprise, right? Thankfully, my husband was ready and willing to bring back food from any place I wanted. He even would have driven up to San Francisco to bring me Piccino or Nopalito. Lucky for us and for our future stomachs that he didn't have to go nearly so far. Just down the street from the hospital is Tootsie's. Tucked in the Stanford Barn alongside the California Cafe, Tootsie's is a little Italian jewel of an eatery that offers high-end coffees and espresso, sandwiches, fresh salads, and breakfasts. Jen Maiser alerted me to Tootsie's existence soon after we moved down here, and we'd been intending to go ever since. Unfortunately, we kept wanting to go for dinner, which they don't serve, so most of our half-hearted efforts were thwarted until I was in the hospital with a days-old baby. Mathra called me from Tootsie's to read off their menu -- I had my laptop in the hospital (of course!) but their website doesn't seem to be operational -- and he didn't get past, "fried chicken sandwich." Man. That sandwich. That SANDWICH! That sandwich isn't just a sandwich. 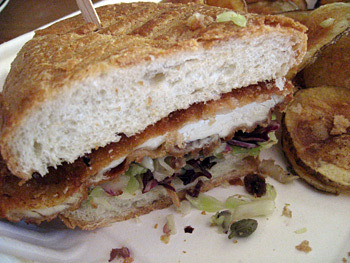 It's a crispy-succulent soul reviver, topped with endive-caper slaw and snugged between two halves of a crusty bun. After getting only two hours of sleep in the 48 hours that followed Henry's birth, that sandwich saved my sanity and kept me from going all Yellow Wallpaper in the maternity ward. I've been home from the hospital for 10 days, and I've had that sandwich -- along with the accompanying homemade oregano potato chips -- four times. If that sandwich was the only thing they served, I still would think Tootsie's was worth it. However, good thing for everyone else (who have enough sense to take me at my word and run, don't walk, to Tootsie's), they also have a brilliant agrumi salad with butter lettuce, radish, celery, grapefruit segments, and shaved fennel; and a white bean, fennel, and flaked tuna salad with the springiest, most pristine arugula outside of Chez Panisse's crisper. For breakfast, I will clog my arteries as frequently as I can with their poached egg on thick toast. Sound prosaic? What if I tell you that the poached egg is topped with celery, olives, and a drizzle of olive oil? Some day I plan to try their crêpe-esque ricotta pancakes with strawberries, but I'm having a hard time tearing myself away from that poached egg. I also had a bite of their veal-pork burger with olives and oregano ground right into the meat and slathered with caramelized onions and mozzarella cheese. I wonder if anyone will believe me when I say that the shoestring potatoes Tootsie's serves with that burger are better than those found at Zuni Cafe?